As you might know, Snakebird was my 2016 Game of the Year. 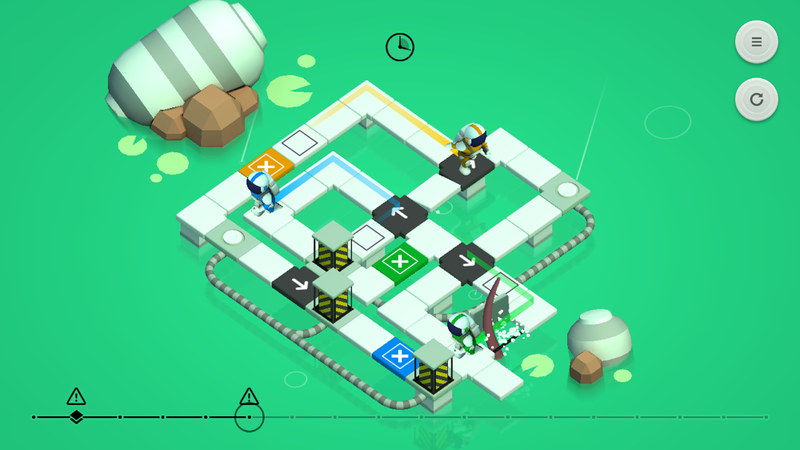 It showed me that a turn-based, seemingly simple puzzler can be tough as nails but user-friendly in every possible way. It made me more critical of the puzzle games I play, looking at them with fresh eyes. Are they just throwing everything they could think of at a player to make it seem longer? Are they punishing the player to make it seem more difficult? Is there anything between the puzzles and the player that just pads it out and wastes time? On top of being a super solid puzzler, Snakebird had the visuals to match it, making it a pleasure to play even when I was hopelessly stuck. Well, Loju’s Causality might be this year’s Snakebird for me. Once again, it shows that a turn-based puzzle game can be brutally difficult without punishing the player for messing up. And it has eye candy and a perfect soundscape to accompany the madness. I like trial-and-error puzzles. I like to be able to mess around as much as I want without being penalized, without being forced to waste my time starting over and catching up again to where I was if I screw up. That’s one of the major reasons I was so drawn to Snakebird. Not only did it have an undo button, but it automatically rewinded for you if you accidentally killed off a bird. Causality also allows — perhaps even demands — the use of trial and error. The game takes you through four different planets of fifteen levels each, with new mechanics gradually getting added. 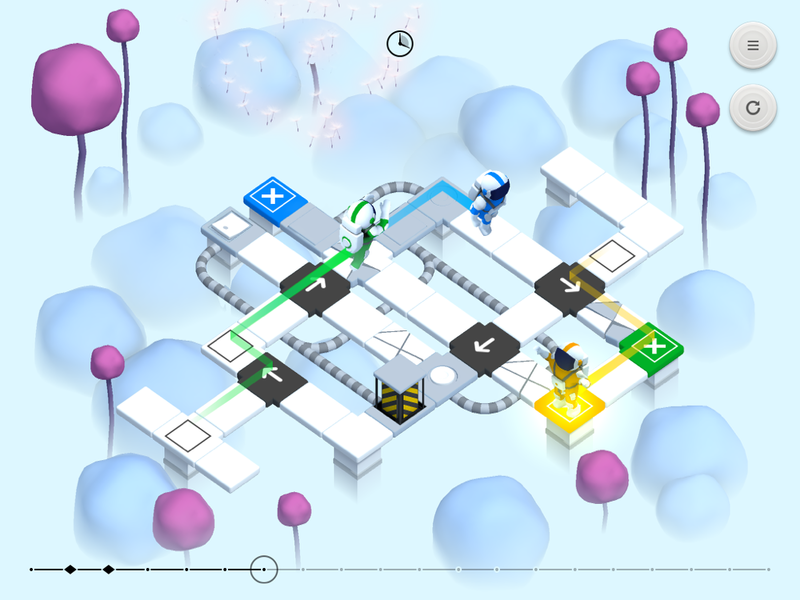 Each of the sixty puzzles has you leading one, two, or three colored astronauts around a floating path to their corresponding exits. The first ten levels of the game ease you into things very gently. You swipe down to move time forward and swipe up to rewind it. The astronauts will run along the path. The primary way to control them is through the arrow tiles. You tap the arrow to change its direction and then when you continue swiping down, the astronauts will head in the direction the arrow sends them. If that doesn’t work out well for you, just swipe back up and change the direction of the arrow. There is a catch, though — each level has a move limit in which you have to complete it. If you run out of moves and the astronauts haven’t all made it to the exits, you need to adjust your solution. But as long as you don’t reset the level, the game saves all your actions, which are mapped down on the timeline at the bottom of the screen. This makes it easy to fast-forward and rewind as much as you want to see where you might be able to change something. And I don’t think I’ve seen anything like that before. Causality does ease you into things a bit more gradually than Snakebird does, but for most of the game there’s no hand-holding. Soon enough you’ll be introduced to switches that raise and lower obstacles, cracked floors, alien tentacles, and shadow stalkers that consume an astronaut if they collide. Sometimes you even have to bump two astronauts against each other to get them to change directions. But the mechanic that will mess with your head the most is the time-traveling portal. Teleportation is very common in puzzle games, but they usually only send something through space. In Causality, a portal sends an astronaut back (or forward) in time, so the past (or future) self and present self can work together. The way it works is that when the game notices an astronaut is headed on a path towards the portal entrance, a ghost of that astronaut will appear on the exit portal. It will then continue moving along with the other astronauts, while the original will disappear when it finally makes it to the portal. If you change anything that prevents the original from getting to the portal, its ghost will disappear, because the original never made it through the portal. Yes, time travel is hard to explain and it is most certainly confusing while you’re trying to sort things out. But that’s why the fast-forward and rewind is such a crucial part of this game. You might make a change and all of a sudden a ghost appears far from the portal and you have no idea how it got there. Well, if you rewind a bit, you can see what happened. It will really mess with your head until you get a handle on it, and maybe even still then. It’s pretty wild. The game is user-friendly in that even if you don’t full understand how things work, you can still mess around with it and see what happens, using trial and error to find the solution. That method likely won’t help you late-game, as you really do need to understand time travel by then. But you should be able to get through the first ten levels of the first couple of worlds, at least, while you’re still working things out. You can see it in action in the video below. I don’t often like move limits in games, especially if they come with a three-star system. They’re usually something I’ll put up with if I like a game enough, but it’s rare that they feel like more than a gimmick. But I do think Causality is a better game because of those restrictions. I don’t get the sense from it that the developer threw something together, solved it, and then said “ok now you need to do it in the same number of moves.” The move limit is built into the puzzles and each puzzle feels handcrafted with purpose. If there’s a solution that brings you one or two segments short, that seems by design, not oversight. This does mean, though, that there’s not much room for creativity, like there can be in Snakebird. Other than a few levels that have achievements for completing them in fewer moves or actions, you’re basically going to have to figure out the solution the developer intended. But the game is still very user-friendly, since you’re never forced to restart completely, even if an astronaut dies. You just rewind. The only frustrating part about this is that if you’re rewinding and fast-forwarding a lot to tweak your solution, the game saves each action. This means, if you turned an arrow one way, rewind a bit and want to turn it a different way this time, you need to do it at the same moment on the timeline or when the astronaut is standing on it. If you turn it too soon, the game will just turn it back to what it remembers it being in the future. Yes, it’s confusing and a little hard to explain. And while it could be a little bit tedious to deal with these issues, the relaxed, turn-based environment keeps the annoyance to a minimum. Had it been a timed, reflex-based game, these quirks would most likely have made me quit. But as is, they’re just part of the game and something you have to try and be mindful of to minimize the frustration. The benefits far outweigh the inconveniences. If the developer could find a way to keep the integrity of the game while reducing those frustrations, I’d welcome it, but I fear that might be impossible without getting rid of the positive aspects. And the more you play, you learn to work around these little quirks. I also like how you only have to complete the first ten levels of each world in order and then the last five are all unlocked at once. This means after you beat the first ten levels in the game, you’ll have six more available to mess around with. Since it’s such a brutal game, I really appreciated having more than one level to work on at a time. Often, taking a break from a puzzle was all I needed for the solution to come to me. And while I wouldn’t say that many puzzles are easy, the last five of each world are usually tougher, acting as bonus levels for those who get through the rest of the game. I much prefer this over forcing the player to go in a strictly linear path, one level at a time. And just recently, they even added the ability to skip one of the first ten levels on a planet if you’re stuck. While this came a bit late for me, it is a welcome addition. I’ve been spending a lot of time with the game over the last week and I beat all but the last six levels. Some had me stumped for a good long time, so I was happy to have a palette cleanser available through other unlocked levels. These types of considerations really improve the quality of life aspect of the game. There is one weird thing that I have mixed feelings about, though. You can create a paradox in the time-traveling levels. This is usually caused by trying to send a ghost through a portal, thus creating a ghost of the ghost and sending all of reality into flux. The first time I created a paradox, I didn’t understand what was happening at all. It was on a super tricky puzzle that I had been working on for the longest time. When it happened, I thought maybe that was part of the solution. But instead, it turns out that creating a paradox is like breaking the game. Even if you manage to complete a level that way, the game won’t accept it. You have to get out of the paradox and solve the puzzle properly. While I understand this was necessary, it did feel a bit like a weak point in the game, something that perhaps should have been designed around so it can’t happen. Or perhaps even making it part of some puzzle solutions. Still, it’s easy to forgive when the rest of the game is so well-crafted. And besides, it’s pretty fun to mess around with. And of course, I need to mention the audio and visuals. I try to be open-minded about a game’s artwork, but the truth is, the easier a game is on my eyes, the more willing I’ll be to put in the time with it. There have been other puzzle games that I liked the mechanics, but I didn’t enjoy staring at them for hours while I figured out the solutions. But that’s not a problem with Causality, even on a small iPhone screen. Its low-poly artwork is very easy on the eyes. Each world has its own background that changes with each step forward in time. My favorite one is the dark blue of the second world, with ice crystals that bloom as they form. However, the board itself might come off a little too clean-cut and clinical, with its stark whites and sharp edges. I had a similar complaint with Lab Like’s Magic Flute by Mozart, although it’s far less of an issue here and does seem somewhat necessary to keep things clean and clutter-free, so I’m not sure it could have been done any other way. The astronauts also run smoothly around the path, either one segment at a time in slow-motion, or quickly if you hold your finger on the screen instead of making short swipes. 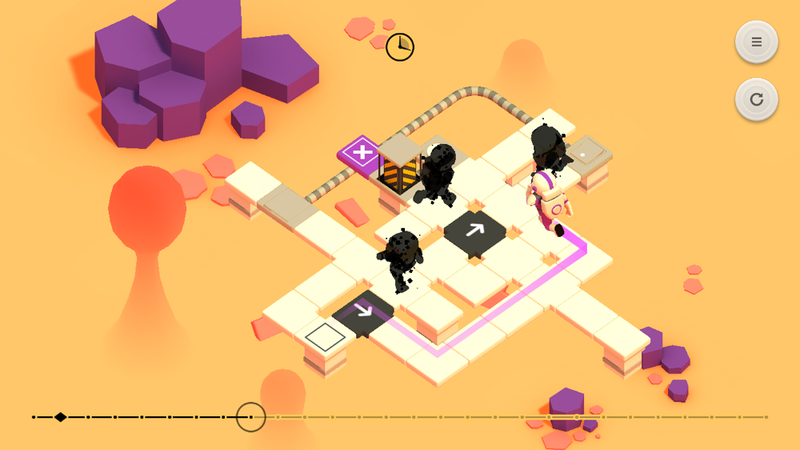 The fluidity of it all reminds me of Lara Croft GO, another turn-based game that comes to life through its gorgeous low-poly animations. The astronauts even do a little dance when they make it to the exits. There’s also a glitch effect when you rewind that looks like a VHS tape rewinding. And all the gorgeous visuals are accompanied by an equally brilliant soundscape. The relaxing, atmospheric music fits the game perfectly, while never getting stale. It’s exactly how I like my in-game music. The glitchy sound effects that join the actions in the game just tie the whole package together, creating a crisp, clean experience that’s easy to stare at for hours. And that’s good, because you will likely get stumped often! I do wish there was a quick-save that would allow you to pick up where you left off on a specific level if you leave it open when you close the app. Snakebird does that and it’s great. I mentioned it to the developer and he was open to it, so hopefully future players will have that extra convenience. Sadly, there’s no iCloud, but the game plays well enough on an iPhone, so I would choose that if you have both. It’s an easy game to play on-the-go since there’s nothing reflex-based about it. I even solved one level while waiting for the bus after being unable to do so in the quiet of my own home. That also made me wish there had been a way to play in portrait mode with one hand. Basically, I have the same two complaints I had about Snakebird. Still, these complaints are minor. Any little quirks are mitigated by the way the game lets you fast-forward and rewind and saves everything you’ve done as long as you don’t reset it. That it does this and manages to stay challenging is a testament to just how well-crafted these puzzles are. Like Snakebird, it doesn’t sacrifice quality of life features to make the game harder. 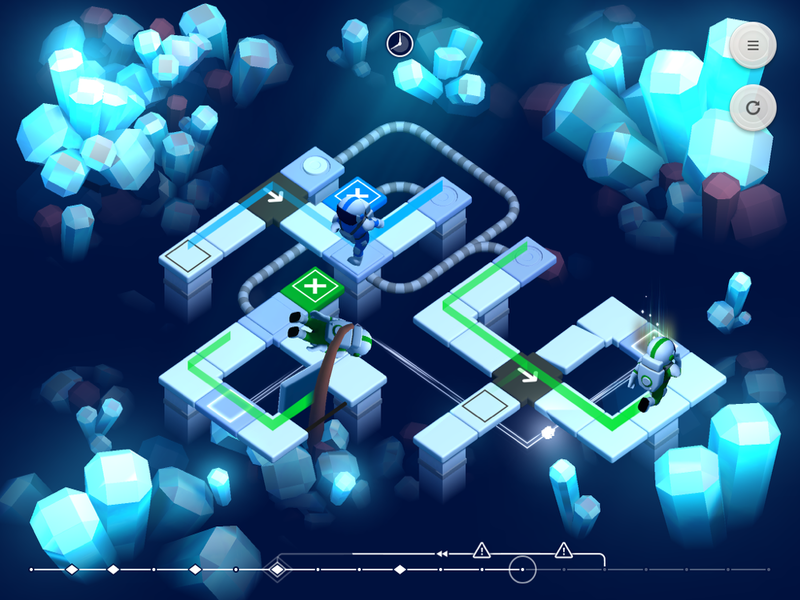 If you’re looking for a challenging but fair puzzle game that will likely break your brain, Causality is for you. It’s not for people who want an easy puzzler where they can breeze through four hundred levels without breaking a sweat. It’s for those who rather have fifty to sixty puzzles that will really make you think. You have to be ok with working on a puzzle for a good while before the solution comes to you. But just about every level is incredibly satisfying to solve. It feels really good when you finally get it. There’s so much here to love, and the game feels unique with both its time-traveling mechanic and the way it handles the movement forward and backward in time. 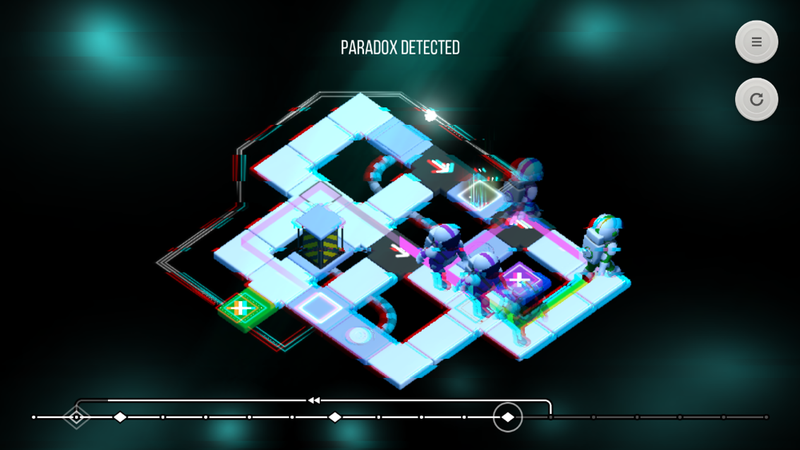 Causality is the real deal, and I’m so glad it made its way to iOS with simple controls — and we only had to wait an extra week for it! If you like your puzzle games to hurt your brain, go download Causality here and start bending time. If you’re hopelessly stuck on Causality and need some help, try my walkthrough guide. I also wanted paradoxes to be embraced in the game.